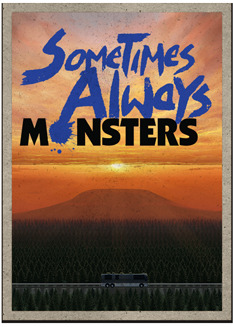 Sometimes Always Monsters is the antithetical sequel to 2014's hit philosophical role-playing game, Always Sometimes Monsters. Saved Imports: A good continuity is a terrible thing to waste, which is why Sometimes Always Monsters features full save imports for those of you who have already completed Always Sometimes Monsters. Your characters and choices will be carried into the new game, picking up the story (however sordid) where you left off. Good Times: Already done the hard part, it's time to take it easy. There are plenty of laughs to be had on the way down the slide, and rarely tears after the landing. It's what makes the whole ride possible. It's time to enjoy the finer things in life, while you still can. Financial (in)Stability: You begin the game with a lump sum, the remainder of your fortunes and prospects. How you manage your vast wealth in a world full of good reasons to lose it will determine how long it remains yours. Any well funded trip tends to attract its own brand of demanding company. Work Schmucks: No longer a nothing, yet still not that much. You're overqualified for box pushing and too inexperienced for anything else. If there is salvation to be found, it's somewhere in that sequel you just can't seem to finish. Finding success a second time shouldn't be too hard. Loved and #famous: Feel the intimacy of a shared experience with your spouse, and the ever-present connection with an unseen greater whole. A demanding public and private life leaves little room to share for either. How the two are balanced will define how the world perceives you. Immorally Morally Amoral: Void of any formal judgement systems, what you make of ethics is more of a personal deliberation. Consequence is persistent, but none can say they truly knew right from wrong. The world demands that you figure it out for yourself. Ultimately, you decide who you are. Congratulations – You’ve Finally Made it. With your love at your side and your first book on the best-seller list, there’s nothing that seems impossible to you. You’ve set the pain of your struggles behind you and settled into a comfortable life of stability. After all you’ve been through, surely there is no doubt it’s well deserved. However, despite all you’ve earned, dissenting voices whisper of you from obscurity. They call you a monster, manipulative and unrepentant. Some seethe with jealousy, others send you unwarranted praise. Fanatics regard you with reverence, while the old guard question your true worth. Only You Can Decide If they’re Right. Always Sometimes Monsters was the story of a struggling author trying to achieve something by winning back the love of their life. It was a tale about the trials we go through in the efforts to define ourselves. Sometimes Always Monsters is the other side of the same journey. Beginning the game both married and successful, this story will take you on the carefree downhill slide that comes after every great climb. In as many was as possible, the games are designed to be reflections of one another. There are many parallels between the two, but they are opposites more often than not. Everything about the game’s setup and tone has been turned on its head to provide a familiar experience with a very different range of emotions. No longer alone in your journey, you will be accompanied by a hand-selected group of authors who can join you on your daily adventures. Together you will explore the city stops of your bus tour and influence each other as your capacity for friendship and forgiveness will be put to the test. In addition to your fellowship of scribes, you will have the opportunity to bring your spouse with you on the expedition. The connection you share with them is pivotal to the outcome of the storyline, but the freedom to manage it will be left to you. Deciding what role your significant other plays in your new life is crucial to maintaining that relationship. Having your husband or wife accompany you may bring you closer together, but it may also tear you apart. Similarly, the choice to venture onward without them may leave your household more stable, but possibly at the cost of what closeness you shared.